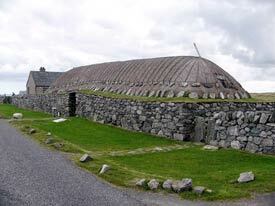 ABOVE: Our favorite shore excursion may have been a tour in the Outer Hebrides, where our guide, Chris Ryan (see inset photo), introduced us to a traditional "blackhouse" and several prehistoric sites. Tours are a fixture of port-intensive cruising, and Silversea makes it easy for passengers to visit major tourist attractions without feeling like they're on a class trip. To make tours more enjoyable, Silversea keeps tour groups small (about 20 people, or half a busload) and provides escorts from the ship who bring supplies of free bottled water and first-aid kits. The tour desk can also arrange for private excursions, and--unlike some ships' tour offices--it gives advice, maps, language "cheat sheets," and other materials to guests who prefer independent sightseeing. Best of all, the Silver Whisper and other Silversea vessels offer free shuttle buses whenever the ship isn't within easy walking distance of the city center. These buses typically run at least once an hour in both directions, even when the port is a fair distance from the ship (as it was in Edinburgh, which was a 30- to 45-minute trip by road).